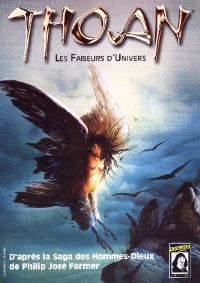 THOAN RPG is a 430 pages book, written in French, separated into 20 chapters. 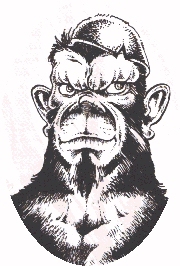 In this Science-Fantasy Roleplaying Game, players incarnate creatures from the pocket universes who try to control back their destiny. They have discovered by accident the existence of "gates" and Lords, and join together in order to survive. Eventually, they get involved in the Thoan struggle. - but only dispossessed Lords, who have lost their universe, who live like the creatures they made and try to conquer their universe back... or a new one. Those Player Characters are chased by Thoans and their agents (gworls, humans, strange creatures, such as intelligent crows called "Eyes of the Lord"), for Thoans know these leblabbiys (thoan word for "lesser beings") have used Gates and therefore represent a threat to them : they could reach the Palace, they know the truth, one of them could be a Lord, etc. PCs begin the game in the World of Tiers, most beautiful world of all, and will eventually travel from one universe to another through the "gates", realizing step by step what reality is, who Thoans are, and trying to survive with their secret. They will discover new exotic places, new worlds, have access to new incredible technology, and live lives pretty close to what Farmer writes in his novels. Adventure is the key word of the game. - A solo adventure that makes you understand the basics of the game system and introduces you to the World of Tiers. - an easy-to-learn 6 sided dice Game System (25 pages) with an original concept : Scales, thanks to which, you never need to use more than six dice. - a full description of the five Tiers, with their inhabitants (history, habits, lifestyle), their strange flora and fauna, and the mystery places to discover. -Over 180 illustrations of the fabulous five tiers. The covers of the French translated World of Tiers novel series and the Roleplaying game are painted by Siudmak. The picture of THOAN shows Podarge, the harpy, flying in the green sky of the World of Tiers, looking at us and wondering how to react. The painter, Siudmak, was born in Poland in 1942. He studied in many renowned art schools (Warsaw) before graduating in Ecole des Beaux Arts, Paris. He is considered as one of the main artists in "Fantasy realism". Internationally famous, he has exhibitions all over the world (Cannes, Paris, Warsaw, Moscow, Colorado, New York, Finland, Ireland, Canada...) and is admired by many artists or film makers, such as Jean-Jacques Annaud, Georges Lucas, or Federico Fellini. Siudmak's technique is very pure, incredibly detailed. His great imagination and his love for Science-Fiction designate him as a major Fantasy artists, working for many publishing companies in Germany, Japan, United States and France (Pocket, a science-fiction collection in particular). He has made many billboards for such great conventions and film festivals as Cannes, Avoriaz, Montreal. Siudmak painted an original board for the Game Master Screen of Thoan RPG.